Converting Castings to Hogouts Modern Machine Shop 95 causes of delay that stand in their way." But as a final point, Mr. Bloom notes that this drive toward analyzing data and responding to inefficiencies applies beyond the shop f loor as well. It applies in the office, too, he says. It applies to quoting, for example. 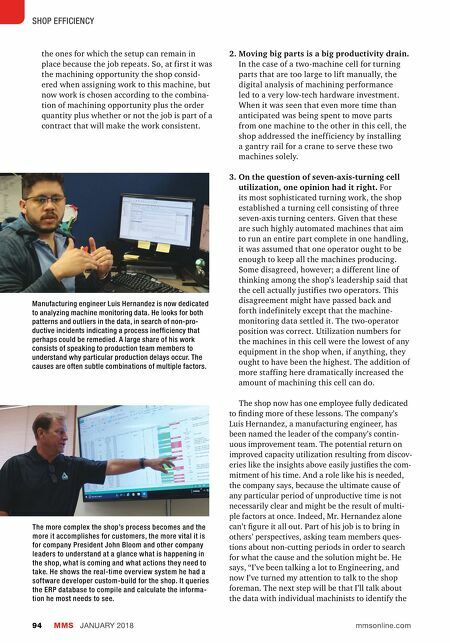 Even before machine monitoring, the company recognized the value of routinely analyzing finished jobs in terms of "how did we quote versus how did we do," he says. One lesson that has come of this practice recently: The company has been too aggressive in quoting steel. In essence, the shop assumes it machines steel faster than it actually does. Maybe there is an opportunity for process improvement here, but for now, steel work is being quoted more accurately, because it is quoted with a slower expectation of cutting speed. In fact, just obtaining needed information can be a source of inefficiency and a source of signifi- cant lost time. Mr. Bloom first realized this about seven years ago, he says. 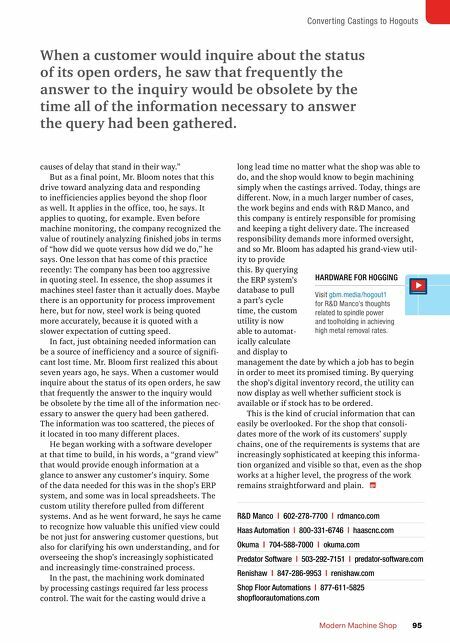 When a customer would inquire about the status of its open orders, he saw that frequently the answer to the inquiry would be obsolete by the time all of the information nec- essary to answer the query had been gathered. The information was too scattered, the pieces of it located in too many different places. He began working with a software developer at that time to build, in his words, a "grand view" that would provide enough information at a glance to answer any customer's inquiry. Some of the data needed for this was in the shop's ERP system, and some was in local spreadsheets. The custom utility therefore pulled from different systems. And as he went forward, he says he came to recognize how valuable this unified view could be not just for answering customer questions, but also for clarifying his own understanding, and for overseeing the shop's increasingly sophisticated and increasingly time-constrained process. In the past, the machining work dominated by processing castings required far less process control. The wait for the casting would drive a When a customer would inquire about the status of its open orders, he saw that frequently the answer to the inquiry would be obsolete by the time all of the information necessary to answer the query had been gathered. R&D Manco | 602-278-7700 | rdmanco.com Haas Automation | 800-331-6746 | haascnc.com Okuma | 704-588-7000 | okuma.com Predator Software | 503-292-7151 | predator-software.com Renishaw | 847-286-9953 | renishaw.com Shop Floor Automations | 877-611-5825 shopfloorautomations.com long lead time no matter what the shop was able to do, and the shop would know to begin machining simply when the castings arrived. Today, things are different. Now, in a much larger number of cases, the work begins and ends with R&D Manco, and this company is entirely responsible for promising and keeping a tight delivery date. The increased responsibility demands more informed oversight, and so Mr. Bloom has adapted his grand-view util- ity to provide this. By querying the ERP system's database to pull a part's cycle time, the custom utility is now able to automat- ically calculate and display to management the date by which a job has to begin in order to meet its promised timing. By querying the shop's digital inventory record, the utility can now display as well whether sufficient stock is available or if stock has to be ordered. This is the kind of crucial information that can easily be overlooked. For the shop that consoli- dates more of the work of its customers' supply chains, one of the requirements is systems that are increasingly sophisticated at keeping this informa- tion organized and visible so that, even as the shop works at a higher level, the progress of the work remains straightforward and plain. HARDWARE FOR HOGGING Visit gbm.media/hogout1 for R&D Manco's thoughts related to spindle power and toolholding in achieving high metal removal rates.